Find the right Matrix Specialty Lubricants product for the current lubrication you are using with Lube Equivalents. 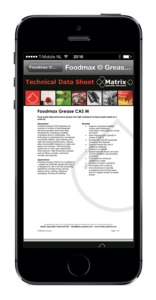 View Tech Data Sheets, request a Safety Data Sheet, even select the lubrication category in which you are looking for. A handy search feature is also integrated when the correct name of the current lubrication product is unknown. The free App is available for iPhone. Select the right Metal Working Fluid based on specific operations and applications where all relevant parameters can be taken into consideration, like type of operation, type of metal, type of application, boron & amine free and more. A handy water hardness converter is integrated in the app which supplies you with the right setting for a suitable product advice. The App can be downloaded for iPhone free of charge. 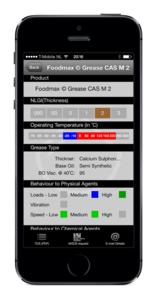 Never before was selecting “the right grease for the right application” so easy. 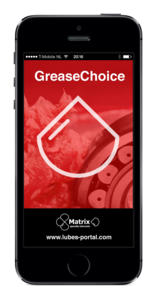 Matrix Specialty Lubricants BV introduced a free App which allows users and distributors to select a grease based on specific applications and circumstances while taking all relevant parameters into consideration like, temperatures, speed, vibrations, water, chemicals, etc. Just simply fill in the data in Grease Choice and the suitable grease(s) will be advised! The App can be downloaded for iPhone and Android.